T. McCants Stewart was a prominent African-American in his day, a lawyer during the Reconstruction who later became a minister, politician, and racial activist and was regarded by his peers as one of the most significant black leaders of his generation. This book illuminates the professional career and private lives of Stewart and his descendants over three generations, providing an epic account of an African-American family in America. Albert Broussard researched Stewart family papers and interviewed nearly every surviving family member to tell their unusual story. He not only presents the first major study of T. McCants Stewart's civil rights and political career; he also tells how Stewart's descendants rejected white society's negative image of blacks and worked to improve themselves and uplift their race: Stewart's son Gilchrist became a successful civil rights leader and attorney and his daughter Carlotta an educator, while granddaughter Katherine directed a Head Start program and her husband Robert Flippin was the first black parole officer at San Quentin prison. The saga of the Stewarts begins in antebellum Charleston but moves on to New York, Africa, Hawaii, and numerous other locales to relate how this family fulfilled a mission to provide leadership and service to its community. Exploring issues of class, intergenerational relations, and community activism, it provides a wealth of material on the black community that spans two centuries. 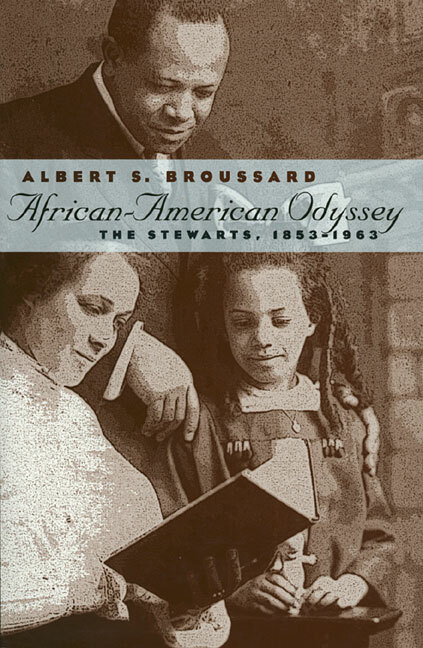 A particular value of Broussard's work is his account of how Stewart women coped with an overbearing patriarch and forged meaningful careers in an era when black females usually held menial jobs. By sharing experiences of both genders, he offers insights into the different strategies that black men and women used to meet their personal goals and collective obligations. Intelligent, ambitious, and entrepreneurial, the Stewarts have much to tell us about what it was to be African-American over the last hundred years. By linking their history to the changing status of African-Americans at home and abroad, this book weaves the contributions of an extraordinary family into the larger drama of American race relations. Albert S. Broussard is associate professor of history at Texas A & M University and author of Black San Francisco: The Struggle for Racial Equality in the West, 1900-1954, also published by Kansas.